Wills and probate records can provide valuable insight and speculation into family dynamics that I find fun to consider. Such is the case of James Ashley (J.A.) Hobbs (1843-1920). J.A. Hobbs was a civic leader. He was the Clerk of Superior Court in Williamston, Martin County, North Carolina. He died on 29 November 1920; his wife preceded him in 1913. At the time of his death, he had five living children. Only three days after his death, on December 2nd, his oldest daughter, Annie E. Armstrong, applied to be the administrator of his estate and indicated that her father died without a will[i]. Also, in that application she mentioned that the five living children, Charles L Hobbs, R.R. Hobbs, J Floyd Hobbs, Mary L. Howell, and herself would be the heirs to the estate. Although Charles would have been the oldest child, Annie applied, and was granted administration of the F. A. Hobbs estate. About six weeks later, on 14 Jan 1921, a will, dated 10 Sept 1918, was filed with the courthouse[ii]. This will established “friend and lawyer” A. P. Dunning as the executor of the will. In the will, Mary L. Howell was to receive the entire estate, except for $100 to go to A. P. Dunning. Subsequently, Mary L. Howell received everything and the other four children, Charles, RR, Floyd, and Annie received nothing. Many questions regarding family dynamics come to mind. Was Annie trying to pull a fast one or did she really not know that J.A. had a will? Three days after a person’s death seems to me pretty quick for someone to file in probate court. Why did J.A. write out all of the other children and leave Mary Lillian, his youngest daughter, (who was 33 years old) as his only heir? Were the other four estranged from their father? I wonder if J. A. felt that his other children were doing well enough and didn’t need the support that Mary Lillian needed as the wife of a struggling minister. Many questions we may never know the answer to, but it is fun to speculate and wonder. Source: Ancestry.Com – North Carolina, Wills and Probate Records, 1665-1998; North Carolina County, District and Probate Courts., North Carolina, Wills and Probate Records, 1665-1998, Ancestry.com, Wills, 1774-1963; Author: North Carolina. 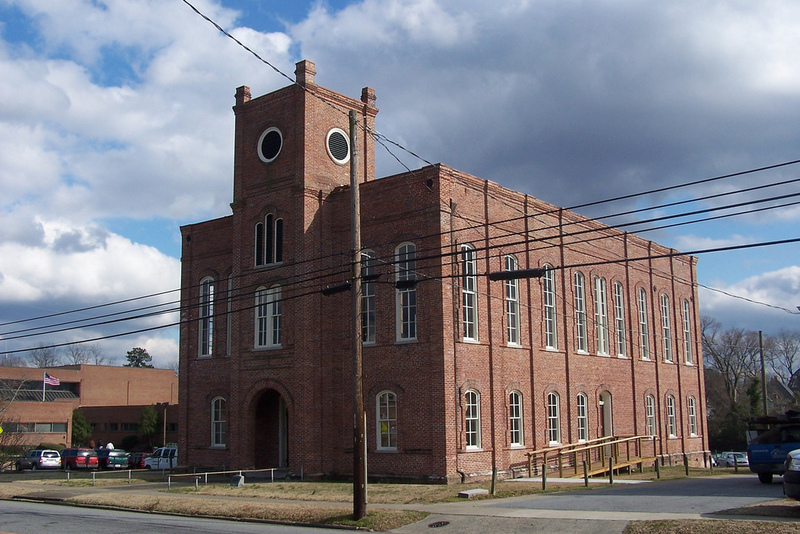 Superior Court (Martin County); Probate Place: Martin, North Carolina – Pages 578 & 579. North Carolina}Martin County} I, J. A. Hobbs, of the county and state aforesaid, being of sound mind and memory but considering the uncertainty of my earthly existence, to make and declare this my last Will and Testament. First: My executor herein named shall give my body a decent burial, pay all funeral expenses, together with all my just debts, out of the first moneys which may come into his hands belonging to my estate. I may have on hand at the time of my death, all notes and bonds of every kind and all other evidences of debt that may be due me at the time of my death. Also my personal affects, including my gold watch and chain, all my household and kitchen furniture, and also any and all insurance policies of mine regardless as to whom some may be payable in the face or faces thereof, including also, two lots of land situate in Beaufort County in Washington Heights, and any and all other property not above enumerated, of which I may die sized and possessed; it being my express purpose and intention to give, devise and bequeath to my daughter, Mary L. Howell, everything of the shape of property of which I may die dived and possessed to have and to hold to her absolutely and unconditionally forever in fee simple. Third, I hereby constitute and appoint my friend and lawyer, A. P. Dunning, my executor, to execute this my last Will and Testament according to the true intend and meaning of the same and every fact thereof, hereby revoking and declaring utterly void all other Wills and Testaments by me heretofore made, and in full compensation for his services in executing this my last Will and Testament, I give and devise unto the said A. P. Dunning the sum of $100 one Hundred Dollars. In witness whereof, I the said J. A. Hobbs, do hereunto let my and and seal this 10th day of Sept. 1918. 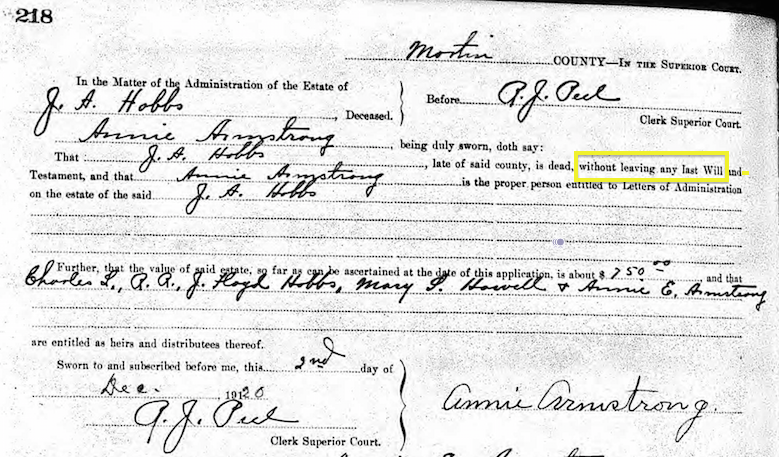 [i] North Carolina County, District and Probate Courts., North Carolina, Wills and Probate Records, 1665-1998, Ancestry.com, Administrators, Guardians Appointments and Records, Accounts, Inventories, Years Support, Executors and Widows Dowers, 1869-1963; Author: North Carolina. Superior Court (Martin County); Probate Place: Martin, North Carolina – Page 218. [ii] North Carolina County, District and Probate Courts., North Carolina, Wills and Probate Records, 1665-1998, Ancestry.com, Wills, 1774-1963; Author: North Carolina. Superior Court (Martin County); Probate Place: Martin, North Carolina – Pages 578, 579, & 580.